What does a newly released Hollywood film have in common with a 147-year-old grand opera? 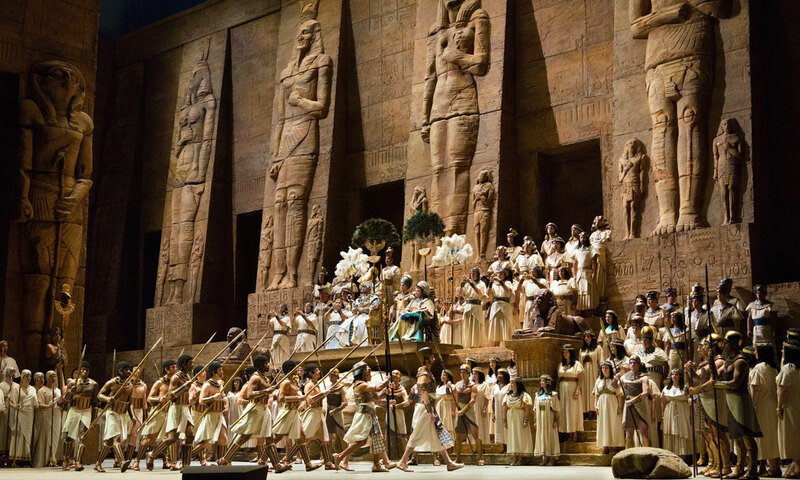 More than you’d think, writes Susan Mitchell, in her review of A Star is Born and Met Opera’s live-streamed Aida. Sometimes it seems that drama and music never move away from those themes. By the end of our lives we will have probably seen more than a thousand films, plays and operas that focus on those two words. The eternal question we must all ask ourselves is: How much would I sacrifice for love? In two days I saw the latest version of the film A Star is Born, starring the amazingly talented American Lady Gaga, and the latest version of Verdi’s grand opera Aida, live-streamed from New York’s Metropolitan Opera and starring Russian-born top operatic soprano Anna Netrebko. Not only do the themes coincide, but the heroines are also forced to ask themselves that same question. A Star is Born is the fourth version of this film. The first, in 1937, starred Janet Gaynor as an aspiring actress and Fredric March as a fading movie star who helps launch her career. In 1954, the story found musical form with Judy Garland as the aspiring singer and James Mason as her guide to success. In 1976, Barbra Streisand was a nightclub singer and Kris Kristofferson played the rock star who uplifts her to fame. Now, in 2018, the latest version stars Lady Gaga in her first film role and Bradley Cooper (also in his first directorial role) as a famous but alcoholic country musician who paves the way to her stardom. Each version of the movie reflects the decade in which it was written but in every film their love is ultimately doomed. Much the same happens to the lovers in the opera Aida, except they both sacrifice themselves for their love (usually in a romantic opera it’s the woman who dies). This opera was first performed in 1871 and has been interpreted and reinterpreted all over the world ever since. What is common to the performances of Lady Gaga and Anna Netrebko is that they are both great actors and great singers at the peak of their careers, and could basically sing in any genre of music. Most commonly known for her outrageous outfits and bizarre reinventions on stage as a pop singer, Gaga is seen here without make-up, playing an under-confident singer, Ally, who only appears in between drag acts. Jack (Cooper) sees her sing and falls immediately in love. What is so arresting is that Lady Gaga is totally without artifice – this is the real woman; complicated but unadorned. Anna Netrebko’s performance in Aida was live-streamed to cinemas (including Palace Nova) from the Metropolitan Opera in New York, and for those of you who think that grand opera exists only for the elite and wealthy, I suggest you give the Met Opera’s latest season a try. Not only do you get the best seat in the house, but in between the acts you get to see the real people playing the singing parts being interviewed on stage, the amazing sets being bumped in and out, and sometimes even the costumes being made. You realise that this is something made by real people for all of us – and you don’t have to find the money to fly to New York. A scene from Met Opera’s Aida. If the new version of A Star is Born was performed live, we would all be giving standing ovations to Lady Gaga at the end, just as the New York audience did for Anna Netrebko in Aida. And the tears would be running down our faces. Both women have become stars by being themselves; they have buckets of talent to spare and prove there is now little difference between so-called high art and low art. The grand opera and dramatic musical deal with the same themes, they ask the same questions and they can create the same feelings in us, the audience. All art aspires to this. Dr Susan Mitchell is an author, a broadcaster and a social commentator. A Star is Born is currently screening in cinemas throughout SA. Met Opera live-streamed performances are shown at Palace Nova Cinemas, with upcoming screenings details here.